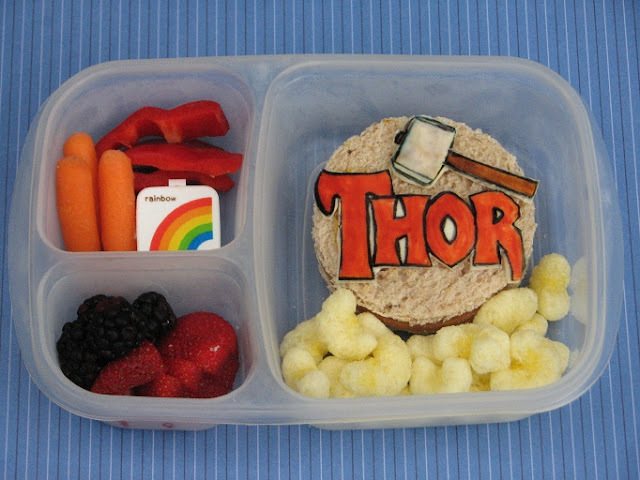 Continuing on with some Avengers themed lunches, today we have Thor! Kidlet only has 2 more days of school left and one day of bento. The last day of school they are getting Subway (donated by a parent who owns one, WOO!) So I have one day left to make a smashing end of school lunch. Yikes! All packed up in an EasyLunchBox Kidlet has a soy ham sandwich with Thor logo and hammer made of cheese and food colors. On the side is Pirate's Booty, bell peppers, carrots, dip, blackberries, and strawberries.